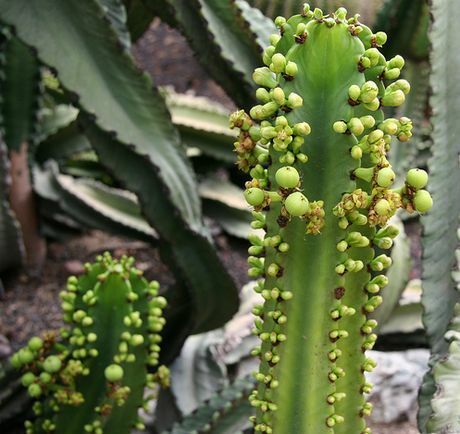 Members of the Euphorbia genus can be either annual or perennial, as they are a large genus, they are split into two and this section is dedicated to the annual varieties. These shrubby plants are grown for their beautiful foliage by gardeners; this is usually bicoloured and includes red and green, and white and green. The plants flower in the middle of summer and reach an height of about 45 to 60 cm in height. Some of the common names for Euphorbia include Ghost Weed, Annual Poinsettia, Fire in the Mountain, Mexican Fire plant, Spurge and Painted Leaf. 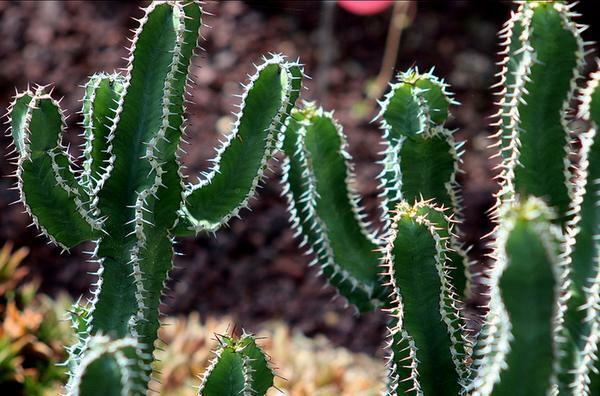 See this page for information on perennial Euphorbia Spurge species. 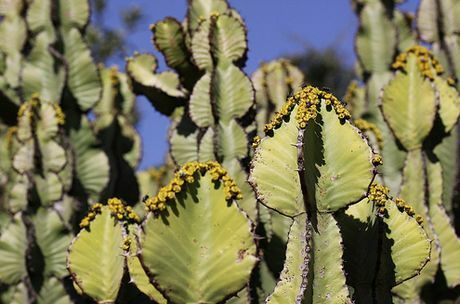 Euphorbia barnardii by DerekKeats; creative commons. Euphorbia ingens by Brewbooks; creative commons. Euphorbia flowers and Euphorbia parciramulosa photographs by whologwhy and Manuel Martín Vicente. Common Names: Poinsettia, Daji, Spurge, Rattlesnake Weed, Sandmat, Devil's Backbone, Sweet Tabaiba, African Milk Bush, Desert Candle, Painted Euphorbia, Paint Leaf, Ghost Weed, Christ Plant, Fireplant: Spurge: Paper; Spotted; Purple; Resin; Sea; Sun; Wood; Tree; Flowering. Life Cycle: Hardy annual, half hardy annual. Height: 6 to 30 inches (15 to 60 cm). Native: Tropical: Americas, Africa. Temperate: Worldwide. Growing Region: Annual: zones 3 to 10. Flower Details: Usually bears male and female flowers on the same plant. In plants that are monoecious, young plants tend to have male flowers and older plants female. Foliage: Leaves may be opposite, alternative or in the form of whorls. Some have attractive multi-coloured leaves. Sow Outside: Annuals: 1/4 inch (6mm). Following last frost. Spacing: annuals 10 to 18 inches (25 to 45 cm); perennials: 12 to 80 inches (30 to 200 cm). 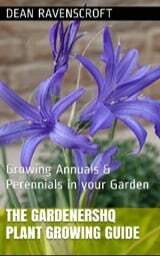 Sow Inside: Annuals: germination time: ten days to one month. Temperature 70 to 75°F (21 to 24°C). Seven or eight weeks in advance. Transplant outdoors well after the last frost; minimum temperature should not drop below 50°F (10°C). Requirements: Annuals: full sunlight. Regular watering. Perennials: full sunlight or light shade. Soil pH 6 to 7. Average soil. Regular watering whilst growing. Propagate: cuttings can be taken following flowering. Or divide in spring in cool climates or autumn in warm climates. Miscellaneous: Wide ranging genus containing herbs, shrubs and trees. Many species are succulents. The name common name spurge comes from the use of sap as a purgative. It is probably best to first grow Ghost weed and other annual Euphorbia plants indoors first. Sow the seeds at a depth of about 6 mm, about two months before they are due to put in the garden (after the last frost of spring. 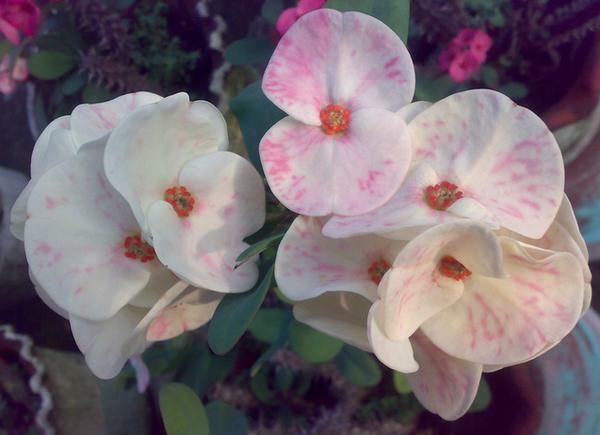 Euphorbia plants such as Poinsettia usually take about two to four weeks to germinate at a temperature of 21 to 24 degrees centigrade. They should be planted out with a spacing of between 30 and 45 cm into a sunny part of the garden that has moist soil. It is important not to plant ghost weed and other Euphorbia members near to garden water features as they contain fish toxins that can leach.